Hyatt Training is now located in the Fitzgibbons Glass Building at 2001 NW 19th Ave, #102 (corner of NW 19th and Vaughn). Learn more about our exciting move and expansion! Hyatt Training personal training gym features a beautiful, 4,500-square-foot, open floor plan in the historic Fitzgibbons Glass Building. Every aspect of the studio was custom-created based on our 30+ years of experience. We have locker rooms, complimentary towels, showers and thorough amenities for our members. Our service-dedicated team ensures that your entire experience is pleasant and convenient. Need motivation, community and flexibility? We encourage all personal training clients to use the gym during our open hours. Professionally crafted workouts are posted on our chalkboard each week and bring balance and variety to your training between sessions with your trainer. Posted workouts are cardio sets, core and base strength workouts so you keep your body and your routine balanced. You don’t need to stress about parking when you train at Hyatt Training. There are two designated parking spots for Hyatt Training clients in front our roll up door, and there are four additional visitor spots available in the parking lot. Plus, there is ample timed and free parking on the surrounding blocks. Sustainability is a key part of our core values. Our new home, Fitzgibbons Glass Building, is LEED Gold Certified. And we reduce, reuse and recycle everything we can in our studio space. 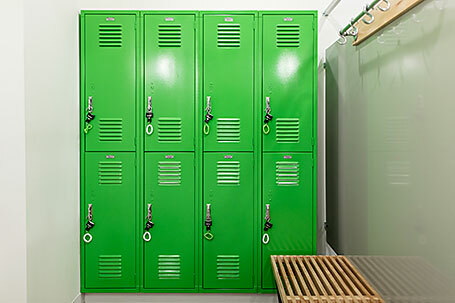 From upcycled lockers to cloth hand towels and recycled rubber flooring, Hyatt Training is green through and through! 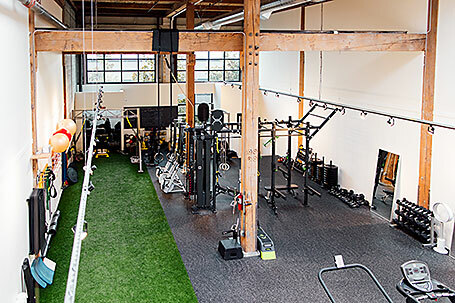 Contact us to rent our personal training gym for your next event or program. Our large, open floor plan is optimal for photo shoots, workshops, classes and meetings. We have extensive event planning experience and look forward to assisting you.